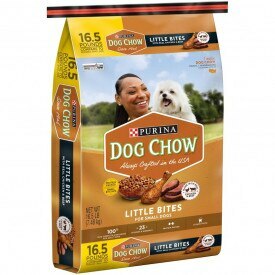 Take care of your little dog's big appetite by serving him Purina Dog Chow Little Bites adult dry dog food. If your small dog is anywhere between 3 and 20 pounds, regular meals of this delicious crunchy kibble mix can provide the high-quality, specialized nutrition he needs. Formulated for small dogs' higher metabolism, this adult dry dog food supports your little buddy's overall health throughout what is commonly a longer life expectancy than larger size dogs. Made with real chicken and beef along with other high-quality ingredients, every bowl of this hearty daily staple is protein-packed for strong muscles and the active lifestyle you two enjoy together. Not only does Purina Dog Chow Little Bites dry adult dog food provide essential nutrition you can depend on, but it also has a taste small dogs love. You commit yourself to his well-being day-in and day-out, which is why it's so important that you choose a healthy food that's committed to his nutrition every day as well.